Because Dapper was just too Damn reliable... nah, seriously, I need to run Microsoft Visual Studio, and doing so under wine was not going to cut it, and dual booting was going to be a pain, VMWare was not open source so....QEMU to the rescue. There's a program called qemu (http://en.wikipedia.org/wiki/QEMU), by Fabrice Bellard. QEMU keeps this "PC's" partition in one single file, so you can copy that file off somewhere safe and have a "snapshot" of your PC for when the viruses and other nasties get in. Other neat things in the documentation. -Just like VMWare you can move that image to another machine running QEMU and it should just work. -QEMU uses a Samba option on the command line to let XP see a samba share, so you can get files in and out of your new OS. make a directory to put the xp image / iso files etc. one off creation of the "partition", I used 4.3 gig so I could burn backups to a DVD. -localtime" tells the new pc's bios to set itself to GMT/UTC from the real PC clock. now go thru the XP install! Notice the "c" not makes us boot from the winxp.img file, not the cdrom, as I've left off the -cdrom option here this PC now has no access to the CD drive. Note : If you get an error when logging on to XP (after entering password). make an iso of the sp2 exe file. boot into XP but press F8 immediately to go into safe mode, pointing -cdrom to the iso file of SP2 will mean that the XP machine will have a "cdrom" available when you boot into it. Use explorer to get to the cdrom and click the exe file to install SP2. One error will com up about "Invalid Access to Memory Location", no biggy, just hit OK and it will finish. I did create winxp.img first. Any suggestions for getting this working? I'm no linux guru or anything, but isn't /dev/cdrom a device and /media/sd0 a mount point? Is ıt fast enough? I`ve tried qemu 3 months ago with my 512MB ram pc but it was too slow to be used. There is something called "kqemu" to accelerate the qemu but ı couldn`t get it worked. So do you need kqemu? Will this work on a PPC Mac? I've just added this to my bookmarks and will try to run WindowsXP on my Dapper Drake in a few minutes. Is it worth it having a Ubuntu base and VMing XP for development? Is it fast? I'm about to redo my system and still have not decided whether I want to do it that way or the dual booting option. I'm in the same boat as far as needing XP for VS.NET dev. Great Post ! I did it on SuSE 10 because I got the idea from you. It took alot of time, but now I have WINXP inside my SUSE. I only need to know How to access the internet from inside WINXP under qemu, and how to acess the cdrom from inside, so I could install VB studio and Office inside. For those whoi find this too slow, but have trouble getting kqemu to compile, there's a great automated script and faq at http://www.ubuntuforums.org/showthread.php?t=187413 that downloads, compiles and installs it all for you. I also use QEMU and find it to be fast enough for my needs. I am using the kqemu kernel module. I have a problem. I've installed XP in it alright but after the installation Im greeted with a login screen. When I login as Administrator and no password it say couldnt log in because of limitations in the account. When I login with my full name as specified in the installation it says couldnt log in. WTF?!! I didnt enter any accounts nor passwords! XP just installed and the went directly to the login screen. Yeah, and another thing. I cant bring up the default log in screen, I get that old skool one where you have to write the account name by hand. I haven't a WinXP Cd Image but I've the CD already burned. Must I create a new Cd Image? To get access to the cdrom when you are inside XP, run it with the "-cdrom /dev/cdrom" option. lorenzone92. No you don't need the CD image you can boot from the actual cd. Yiyoshi / Alberto, you talk about password problems, XP installs have always asked me for a password on setup. I can't help you with an XP install that has not asked you to setup a admin password. Pixie, internet access from XP just worked for me (after boot I ran google and there it was!). I know there are a lot of command line options available in QEMU to do with network access, read the documentation and try some of them. QEMU is not super fast by itself, I recomment trying to get the acceleration program KQEMU working, there is also a program called qvm86, which is an open source accelerator, just google qvm86. I have not got either of these working yet, but will post instructions when I do. Thanks. It worked for me on Dapper and a Certera notebook which is very generic. Intel mainboard and Pentium M 1.73 mhz cpu and 512 mb RAM. Hi I am interested.I have a question.I already have a ntfs partition with installed win XP.can QEMU direct launch it without making a image? Somewhere (I can't really find the article now) I read that quemu-created images can be read through VMWare Player (which is free altough closed-source). So if you find qemu slow, you could try this solution, many says VMWare is really faster than qemu (I didn't try it myself). Anyway, how much RAM do you have installed? On my 512MB laptop it's a crawl! Great article. I'm going to try it straight away. Is there a way to access linux files from the WinXP? Also can you access the files created by WinXP from linux? Then it would actually be useful. FOR ERROR "could not open hard disk image 'winxp.img'"
you have to be in the director where the winxp.img image is. and how can you implement theese two commands into a shortcut? 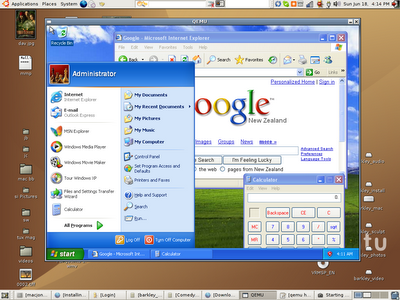 Current version 1.1, June 2006. I installed an xp image a while ago but never realised that installing sp2 would fix the problem. I'm having trouble compiling kqemu though. This post is fantastic! I want to get rid of Windows but, unfortunately, we all know that there are still applications we need to use that run on Windows only. I recentely heard of Ubuntu and I am definitely going to check this installation out. If it works well enough, I could finally remove Windows from my machine and run it in a Virtual Machine only when I need it. This is off-topic, but did you get the resolution on your GatewayM305 latop to work at 1024x768?? I've been having problems getting it to work for over a year now. Any help would be greatly appreciated. That will start the install from the xp.iso file and will reduce install time by at least half over using the actual cd. I like your blog. The articles are amazing. I had to change "/dev/cdrom" to "dev/hdc". Check "/etc/fstab" to be sure. Well, I did everything that you suggested. It all seemed to work, but when I try and start it up it just freezes. Could be that I used the Gateway restore cd that came with the laptop. I will try a different one an see if I have any better luck. Oh, and if you do find a workaround for the gateway screen res stuff, let me know. Not bad for my first virtualization. I only have three questions? And any help will be greatly appreciated. 1) what command can I type into the Alacarte Menu Editor to run QEMU via a shortcut? (tried: sudo cd winxp/qemu -boot c -hda winxp.img -m 256 -localtime) Didn't work. 2) How can I get a Lexmark Printer (P4350) to print under the host and guest OS? 3) How can I drag and drop or copy and paste file between the host and guest OS? qemu -boot d -hda7 winxp.img -cdrom /dev/cdrom -m 256 -localtime and it doesn't work and result is my windows crashed but my linux and windows in qemu still work. Is there any way to install windows on qemu and to have my real windows because I need both. Hi, it's very interesting article, I was using, but i have a problem, the virtual machine don't use bridge, so the virtual machine isn't part of the network. why is the qemu windows small? i dont know if it is always small because it is small right now when installing, but is it actually that small? and how can i make it bigger? does Visual Studio work well ? Hi I have an intel macbook and I eventually plan to run windows through ubuntu as above however I really don't know what I'm doing! I've got as far as backing up all my files and partitioning my hard drive. I've downloaded ubuntu - now I'm stuck. Obviously I can't open the ubuntu files because osx won't read them. What do I do now? It wouldn't let me format the drive as NTFS so had to do FAT32. Other than that, it's installing just fine! I'll post when I have tried VS2005 and Photoshop CS3! I have the same problem than jonesey, is it possible to format it in NTFS after the instalation? There is one thing i dont undertand. Why is it necessary to install windows when you, with other programs like Wine, can import your already installed programs for example Dreamweaver and photoshtop to Linux. Isnt it possible to just "run" windows in the background (like in your screemshot) by using the already installed windows. I find that a bit problematic and would like to figure out why it cant be possible to execute windows with the one already installed. I hope someone can reflect upon this and enlighten me about this situation.